This is 2 coats of Newsprint over 2 coats of Deborah Lippmann Stormy Weather. When I first saw the polishes on KBShimmer's website, Newsprint was the first one I was drawn to. Unfortunately, I wasn't able to pick it up in my first order, as Christy said she had an issue with the red bar glitter and was waiting on a replacement. However, as soon as I saw that it had been restocked, I placed another order before I'd even received my first on. I wanted it that much. Newsprint is one of the more unique indie glitters in my collection and it's easily one of my favorites. 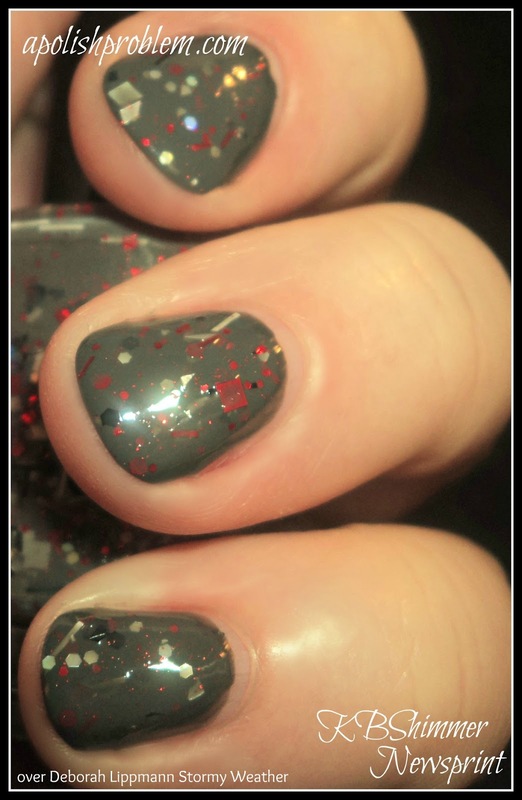 It's a mix of red, white, black, and silver glitters in all sorts of shapes and sizes suspended in a dark grey base. There are bars, hexes, sqaures, and microglitter. In fact, on KBShimmer's product page for this polish, it states that 14 glitters went in to this polish. I had no issues with application or formula on this. The glitters easily came out of the bottle and were dispersed well on the nail. I think you could possibly reach opacity with this polish, but to keep from adding so many layers on my nails, which can lead to goopy-ness, I chose to layer it over Deborah Lippmann Stormy Weather. KBShimmer polishes are available on their website, and sell for $8.50 a bottle. Please note that if you are international, KBShimmer only sells directly to US customers. If you are outside of the US, you will need to purchase their polishes from their stockist, Harlow & Co. KBShimmer polishes from Harlow & Co sell for $9 a bottle. Currently Harlow & Co is out of stock on all KBShimmer polishes, but I read that there should be a restock this weekend. Newsprint was purchased by me. All links within this post are not affiliate links.